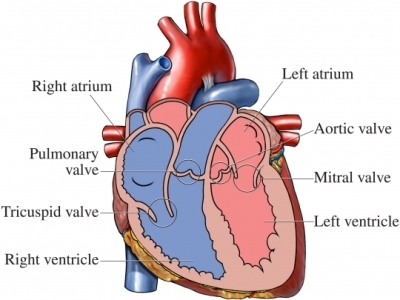 An atrial septal defect (ASD) is a hole in heart. It is in the wall between the left and right upper chambers of the heart. Blood can flow through this hole. This will make it hard for the heart to work well. It can also lead to a backup of fluids in the lungs. The doctor will ask about symptoms and past health. A physical exam may be done. The doctor may hear a murmur while listening to the heart. The doctor may suspect ASD based on symptoms. An echocardiogram can confirm the diagnosis. Not all ASD will make the heart and lungs work harder. These may not need treatment. The heart will be checked during checkups for any changes. Your care team will look for any changes in heart size or abnormal heart rhythms. ASD in infants may close on their own by 3 to 5 years of age. ASD with heart changes may need to limit certain activity. Those with smaller holes or no effects on the heart can often do all activities. A tube is inserted into a blood vessel in the thigh. It is passed up to the heart. Large incisions are not needed. A plug is passed up to the heart. Once in place it seals the hole in the heart. Requires incision to access the heart. May be needed for large holes. Holes may also be located in an area that affects other structures like valves. There is no way to prevent ASD since the cause is unknown. Atrial septal defect. Kids Health—Nemours Foundation website. Available at: http://kidshealth.org/en/parents/asd.html. Updated September 2016. Accessed July 25, 2018. Atrial septal defect (ASD). American Heart Association website. Available at: http://www.heart.org/HEARTORG/Conditions/CongenitalHeartDefects/AboutCongenitalHeartDefects/Atrial-Septal-Defect-ASD%5FUCM%5F307021%5FArticle.jsp. Updated January 19, 2018. Accessed July 25, 2018. Atrial septal defects. EBSCO DynaMed Plus website. Available at: https://www.dynamed.com/topics/dmp~AN~T114791/Atrial-septal-defects . Updated December 27, 2017. Accessed July 25, 2018.